When you’re starting out as a writer, the best thing you can do is to learn from other writers. The same is true when you’re starting out as a published author – you look to the best in the business and try to learn as much as you can. Fortunately, Australian children’s authors are an incredible bunch of people, so when I popped up amongst them as a new author a few years ago, they were generous with their time, their information and their advice. 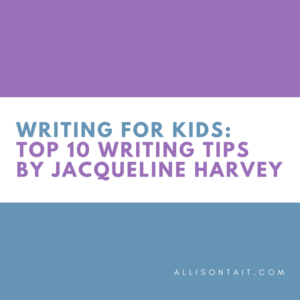 Which is why I’m so pleased to welcome the wonderful Jacqueline Harvey here today to share her top 10 tips for young writers. 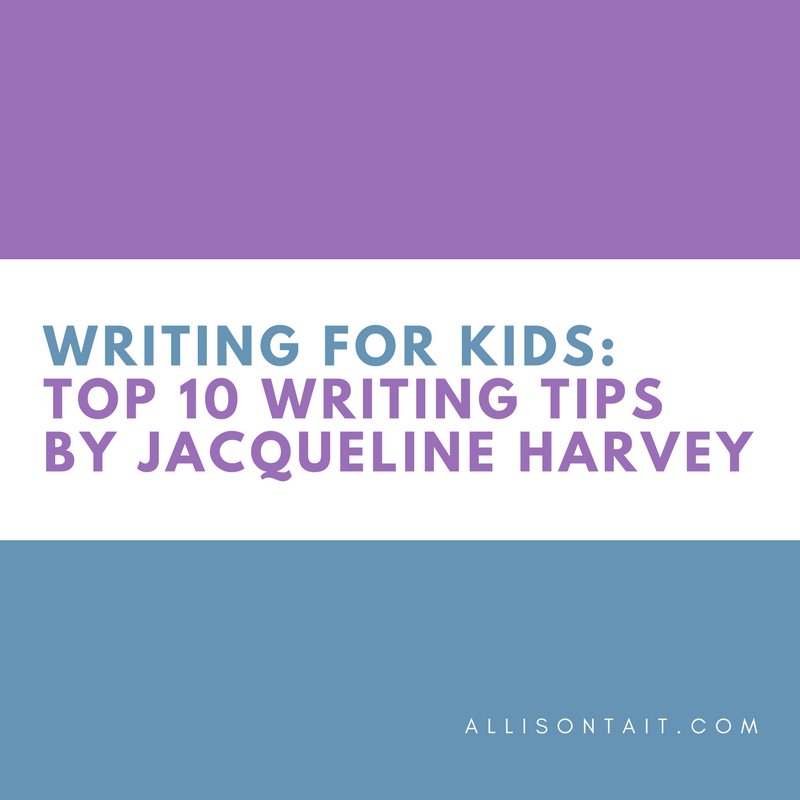 Jacqueline is one of Australia’s most popular children’s authors, having sold over a million copies of her Alice-Miranda and Clementine Rose series’ in Australia alone. She has received numerous short-listings and awards and is in high demand for her wonderful talks and workshops at schools and festivals around the world. Right. Is everyone sitting up straight? Let us begin. Read! Read a lot and read widely. It sounds like a no-brainer but if you’re planning to be a writer you need to learn from the experts and that means people who have had books published. If I come across a particularly extraordinary description or turn of phrase when I’m reading, I’ll write it down and think about what makes it so fantastic. Reading will give you insights into the way writers develop characters, plots and pace – and look at how authors end their stories too. The ending is just as important as the beginning. Writers have well-developed observation skills and I don’t just mean sight. Listen, taste, touch, smell and feel things. Use all of your senses when you’re writing and see what a difference it makes in bringing the words to life. Keep notebooks and diaries and write down things that interest you, descriptions, ideas for stories and characters when they come into your head. I often dream good ideas and have a notebook beside the bed so I can capture those thoughts immediately (otherwise I know I’ll forget). Use places you’ve visited or are familiar with to inspire your own writing. I’ve been to many of the settings I’ve used in my books. However, that said, you don’t need to have been somewhere to be able to write about it either. Research is so important and as a writer I think Google Maps, Google Earth and Streetview are one of the best resources available to us. Even when I am very familiar with a place I’ll often use those apps to support what I’m doing. When I was writing Kensy and Max, a particular area of London was always up on my computer. When you go places and travel, keep diaries and take lots of photographs. They will help you to remember things and come in handy when you’re stuck for ideas. Seek help from experts. When I’ve been unsure about something to do with a location or language or customs, I’ve always sought help from others. For example, when I was writing Alice-Miranda at Sea, I wanted to include a rare species of butterfly that would live somewhere near Barcelona in Spain. I had two issues – firstly, I’ve never been to Barcelona and, secondly, I know very little about butterflies. I researched as much as I could on the Internet but in the end found the International Society of Lepidopterists (Butterfly fanciers). I wrote to them and a fellow from Switzerland helped me with everything I needed to know. It’s your story – have fun with the writing. I’m a planner – I plan the big ideas and always know how it’s going to end – therefore I have something to work towards. I love it when the characters surprise me and we take a slightly different pathway but I find that because I write to very tight deadlines a general outline really helps. Children often don’t have a lot of time to write a story so planning is critical. I also edit as I go and read the work aloud – with the accents of the characters too. This helps me to get inside their heads and be part of the action. Write as often as you can and practise all sorts of different styles. Do short activities that get your creative juices flowing. It might be writing a description of something you have seen or creating a character and knowing everything about them. Creating biographies for your characters is a great way to get to know them well. I always say that I know more about my characters than I’m probably ever likely to reveal to the reader. Enter competitions as it gives your writing a focus and goal. You also need to make sure that you finish your stories. It’s all about perseverance. Think about what sort of story would make you want to switch off from your devices and focus on writing something you love. If you’re bored writing the story, it’s almost guaranteed people will be bored reading it too. The most important thing is to fall in love with your characters and really enjoy what you’re writing. 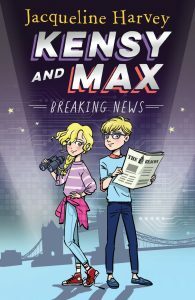 Kensy and Max: Breaking News is out today and is the first book in an action-packed spy adventure about twins whose lives are turned upside down one day when they are whisked off to London and discover their parents are missing. You can find out more about Jacqueline Harvey here. And if you’re new here, you can learn more about me and my books here. Do you have a kid who loves to write (or one who would love to write better)? My online creative writing course for kids is just the ticket! The course is designed for kids aged 9-14, to teach them the tips, tools and techniques of writing – but also to inspire their creativity and motivate them to write! You can find all the details here, at the Australian Writers’ Centre website.